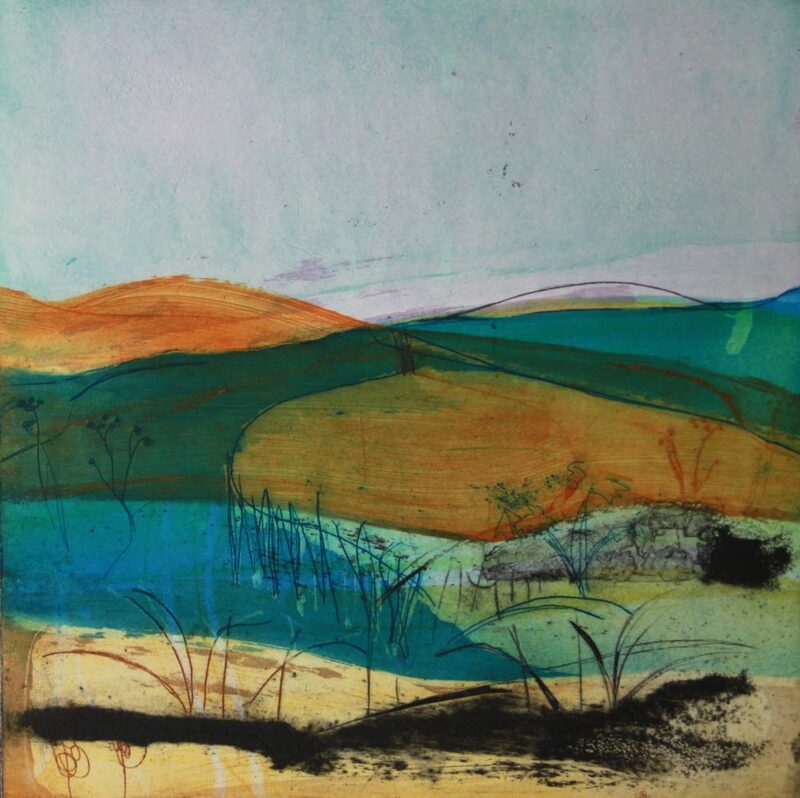 Captivated as a child by the West Country landscape, painter and printmaker Louise Davies, 55, has made it her life’s work to explore the emotions and memories that surround time and place. As her major new solo exhibition, ‘The Elements In Colour’, opens, she tells us about her techniques and inspirations. Let’s beginning at the beginning – where were you born and raised? I was born in Swansea but left when I was a baby and was brought up in Bath and the surrounding villages for most of my childhood. And where do you live and work now? I now live in Blackheath in South London, and my studio is in Woolwich. Could you describe your studio for us? It’s a large open space by the river, with big windows and plenty of natural light. There’s a mezzanine with fridge, toilet, sink and an area to dampen and dry my paper. I have a Rochat press in the corner downstairs, and then a good working area in which to print and paint. That sounds wonderful. And you’ve long shared a studio with fellow painter-printmaker Gail Brodholt – how did that come about? 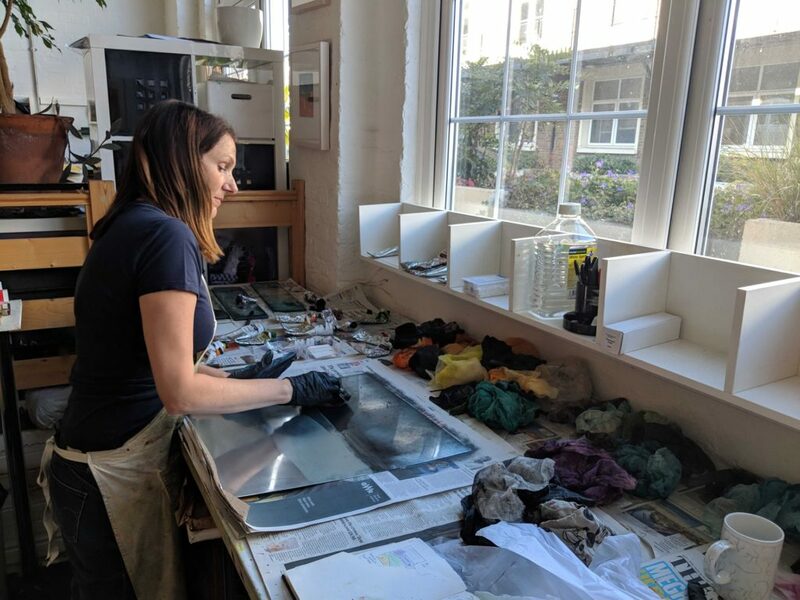 We met when we were both members of Greenwich Printmakers and have now shared a studio together for more than 11 years, firstly with another group in Brixton and then for the past four years on our own. Gail has a large area where she has her Albion press and worktops. The benefits of a shared space are great: being an artist is quite a lonely occupation, having to self-motivate yourself and living with your own thoughts on creativity. Working with another artist gives you support in talking through ideas, having company and I think it encourages you to push yourself forward for opportunities… or just gives affirmation on where you are with your work. I think we share a good partnership, supporting each other in different ways. How does it work, day-to-day? A general working day will be a cup of tea first thing, where we have a catch up on what we’re up to with our work – or just life in general! We tend to have set days in the week when we’ll be in the studio together and then the other days we may come in individually and have quiet time on our own. We work to music – Radio 2 is on all day! I put on my apron and then get on with it. Even if there’s a lot of editioning ahead, I don’t procrastinate. I’m really thankful that I have a job that I enjoy! And where did your printmaking journey begin? 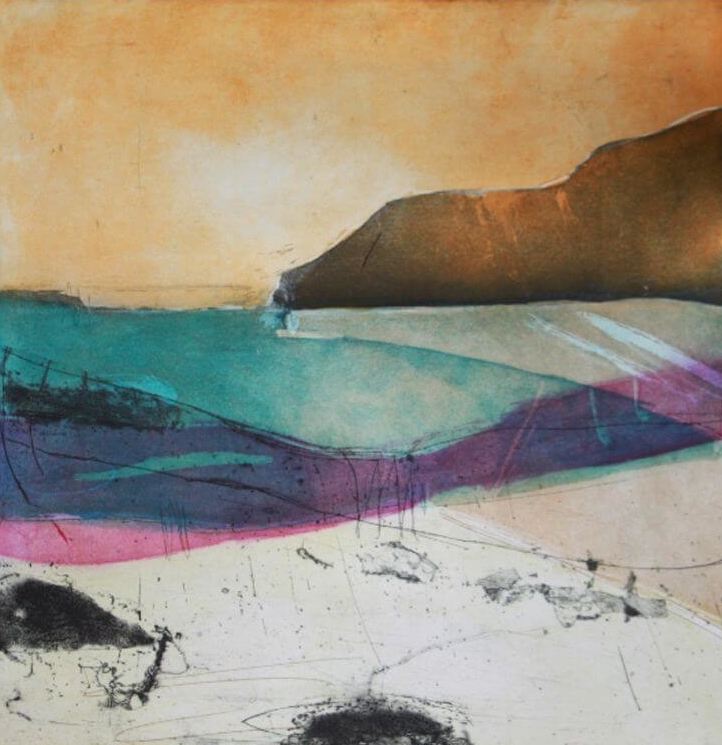 My printmaking journey began when I moved and did my A-Levels at Plymouth College. They had an amazing art department and that’s where I first learnt etching. There were presses, acid and aquatint, and a great art teacher who was very inspiring. To be honest I had a very encouraging art teacher at school in Bath, too. Afterwards I applied to Central Saint Martins and got accepted on to their Fine Art course and then I did an MA in Printmaking at Camberwell. Were you very much an arty child? I think I was always interested in creating, even as a little girl. I was always drawing, painting, colouring in, and found it all came very naturally to me. Was there any one person that inspired you along the way? I had those great art teachers – I think we can all look back and recognise in life how important certain teachers were to us. Then when I was at Saint Martins I was particularly inspired by the artist and tutor Albert Herbert. He did the most amazing, deeply bitten etchings. I loved the way he would just put a plate in the acid and leave it overnight and then work on it the next morning. It taught me how we can be free with the medium and actually make positives out of mistakes. I use this in my work today. I often compare my etching practice to cooking – I guess how long to leave the plate in the acid, and just feel my way through the work to get the final piece. Sometimes accidents can produce the best work. How did you come to landscape in particular? I think I was drawn to landscape because I was brought up in the countryside and had a natural response to it. I spent a lot of time as a young child playing out in the fields with my brothers, and life was very carefree. I still do get a lot of satisfaction from nature, the seasons and the beauty of the land and the weather – even if it’s raining! I love the sound of the rain and also the smell as it falls on the ground; it kind of gives me a comfort within. And which artists have influenced you most? I was completely overwhelmed when I first saw Mark Rothko’s work in London – the atmospheric use of bands of colour. Also Jean Dubuffet, the way he uses texture, and scratching into areas. I saw his work in the early 1980s in London and was captured by the energy and life. And J.M.W. Turner – the use of colour and space and mark-making. Joan Miro, the way he uses colour and marks and shapes to form a balance in his work – something which I always strive for. Finally, Craig Aitchison’s use of rich colour and also Milton Avery – again, his wonderful use of blocks of colour and simplicity. Tell us a little about the title of your new show – ‘The Elements In Colour’. I chose it because I felt it covered the whole meaning and subject matter of my work, and also emphasised probably its main characteristic – colour! 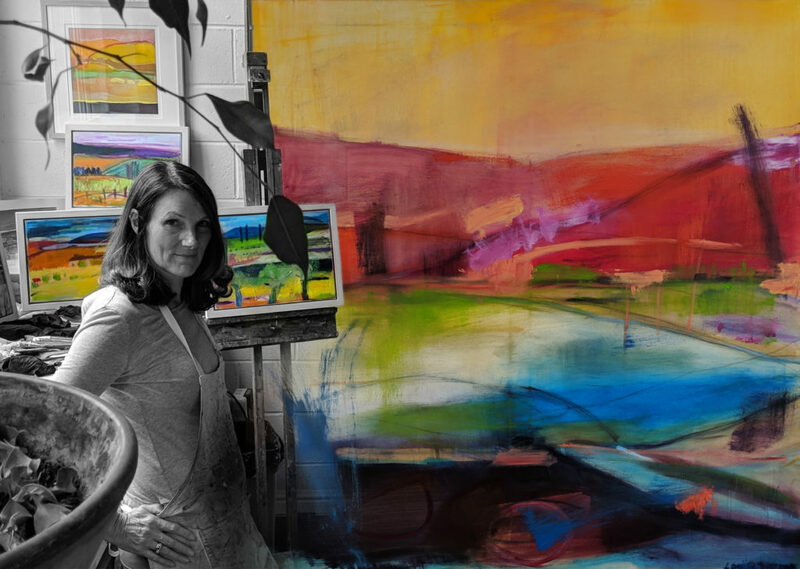 Your work is certainly wonderfully fluid and colour-soaked – has colour always been a big focus and inspiration? Oh yes, it’s always been important to me. When I completed my A-Level portfolio my art teacher was sceptical about the outcome for me, as I had a very unusual use of colour. 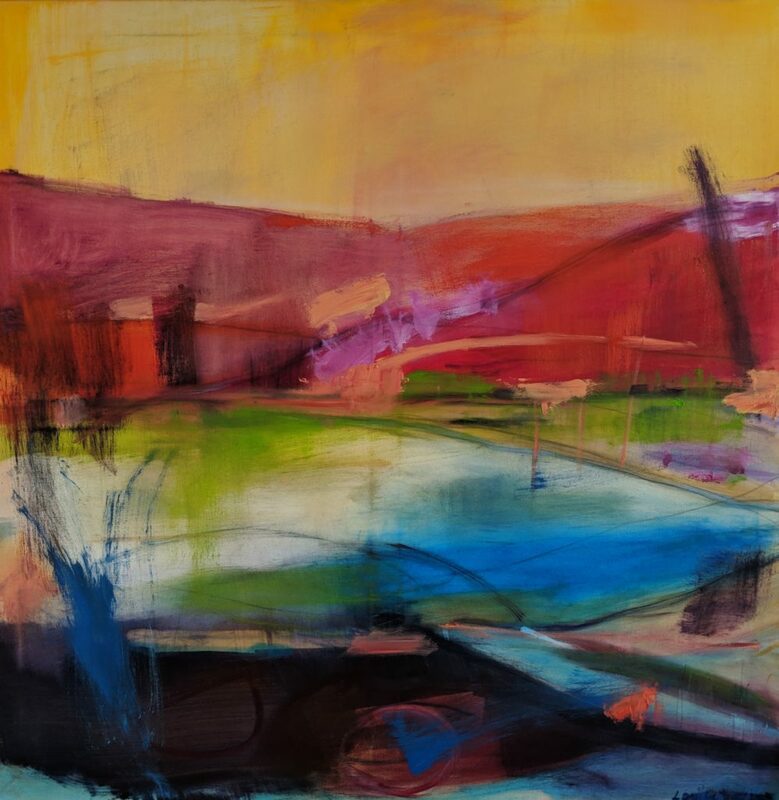 I’d invent my own palette for the landscape – in reality those colours weren’t really in front of me but something in my head that I had to put down on paper. I’m pleased to say that I did get my art A-Level! Memory is also a recurrent theme. 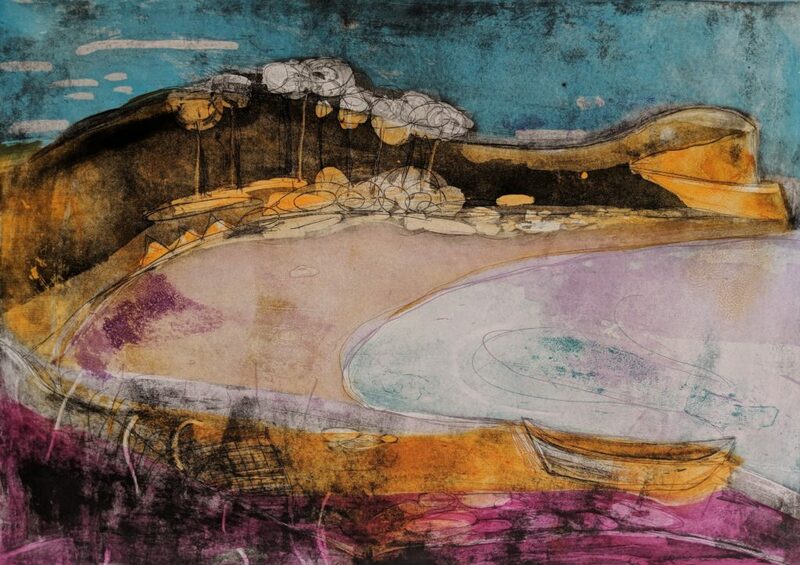 As Gail [Brodholt] once pointed out, your pieces often explore the emotion of a landscape. Could you explain that thought process, and what you aim to capture? Yes, I think memory is important in my work. Perhaps it stems from childhood, playing and walking in the landscape and the closeness to nature. Who knows, but I am sure we bring a lot of things from our past into the making or art work, even if it is in our subconscious? I’m trying to create an emotional response from the viewer to my work. I get a very strong response when I see a landscape of beauty or even if suddenly the weather changes and rain is coming in but that is still a beautiful moment, with the light and feel and drama of the rain or a storm. Do you have a preference for season, or weather? No, I have no preference for weather or season as I find something positive about each. I don’t have a particular preference for place, either. I can get a strong response to the English landscape but equally feel a strong response to a foreign landscape. How do you begin a piece – with sketches? Do you visit in person? All my work starts in the sketchbook. I can’t emphasise enough the importance of the sketchbook. It’s the first immediate reaction to what we see in front of us. Wherever I go I take a sketchbook with me and make a record of what I see, or sometimes write down words or phrases that remind me of the place. My work is about conveying a feeling and an atmosphere. How did you come to etching, and why? At college I was completely enthralled by the excitement of using an etching press and acid to discover this new way of creating my work. The thing about etching, in particular the way I work, is that you’re never completely sure what you’ve got on the plate until it comes to the proofing. I always get excited, even to this day, by that first image revealed when the paper is pulled off the plate on the press! And tell us a little about your process. I work on zinc plates mainly with hard ground. I use at least two or three plates to make an image and sometimes use collagraph as well. But at heart I am a painter and I think this comes across in my prints. They are produced often in a loose but controlled fashion, then with swathes of colour. Yes, I like to paint on canvas and I use oil paint. Again I am interested in mark-making, colour, line and energy and try to get a balance in the final piece. Which are your favourite pieces to date, and why? Ha, sometimes you can’t see what you like about your work at all! However, when I open my plan chest I always get excited by the print ‘Northern Lights‘. This was a bit of a turning point in my work. I started to really enjoy myself by printing the plates upside down and in a different order. I realised that my strength lay in my intuitive response to the making of it and the abstract quality it had. My other favourite would be ‘Distant Shores’. I actually created this print from a drawing I did when my father was ill. It was to be his last holiday and we went out for the day and, whilst we sat together by the harbour and chatted, I drew the sketch. I love the title as well because it evokes the feeling of another land, which is there somewhere but not quite within our touch. 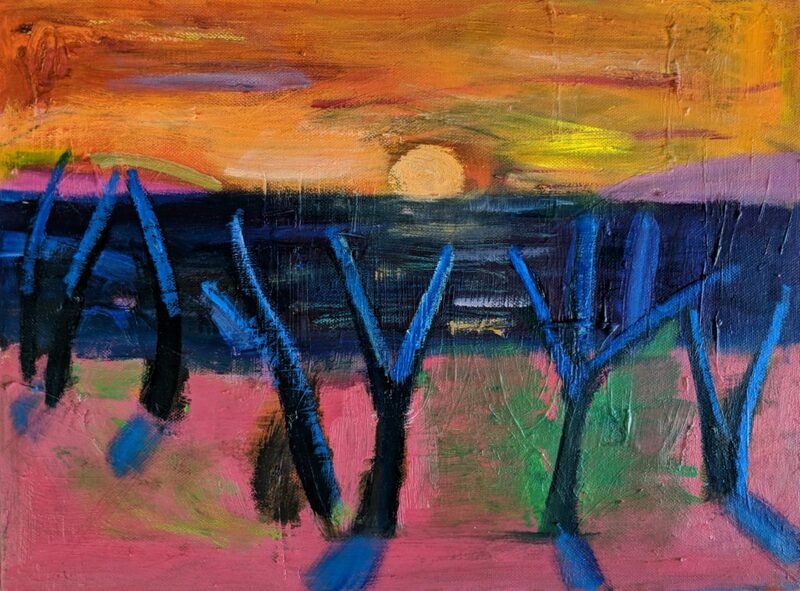 Then the painting I most like at the moment is ‘Red Bay’, which will be in the show. It originates from a drawing I did on holiday in Spain – looking across the bay and capturing the sunset and then trying to evoke the heat of the day. It has strong colour, mark-making, composition, texture of paint. I feel this painting has a life of its own. I think my career highlight was when I was elected to the Royal Society of Painter-Printmakers. I then started to take myself more seriously as I realised I was surrounded by fantastic printmakers who were all at the top of their game! It gave me affirmation and direction for my career as an artist. If you had to sum up your work in five words, what would they be? Atmospheric, colour, landscape, fluid line, calligraphic marks.